A fundraising campaign is underway to bring water to Emma’s Acres in Mission, BC. Emma’s Acres is an agricultural social enterprise business, managed by the L.I.N.C. Society, that employs victims/survivors, ex-offenders and offenders. They produce vegetables, herbs and fruits grown naturally without the use of chemical pesticides and fertilizers on an 8-acre property leased to us by the District of Mission. Produce from Emma’s Acres is sold at the Mission City Farmers’ Market, and there are plans in the works to sell the produce to local restaurants and stores. Some of the produce is also donated to local non profits in the District of Mission including the food banks and the community kitchen. The proceeds raised from Emma’s Acres funds the work of the L.I.N.C. Society in the community and, in particular, its work with survivors of serious crime. For media on Emma’s Acres Check out the April 2014 article in The Province newspaper Fraser Valley farm project aims to give inmates a new stake in the community and the VanCity article Emma’s Acres: Growing more than gardens in Mission, BC. 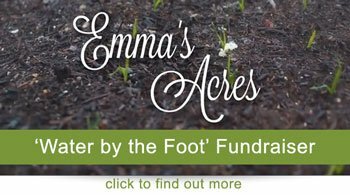 For information on sponsorship opportunities for this fundraising initiative, please visit the Emma’s Acres page under Programs before the middle of July 2014. Donations of $20 or more will receive a charitable tax receipt donor’s names will go on a plaque at Emma’s Acres, as well as on our website and Facebook Page.